I'm seriously considering buying the MKII kit, but living in Japan, space is really at a premium in the houses. Can anybody give me rather accurate overall dimensions for the kit. The depth is probably most important and I need a figure that runs from the outer edge of the front-most cymbal to the back of the seat. 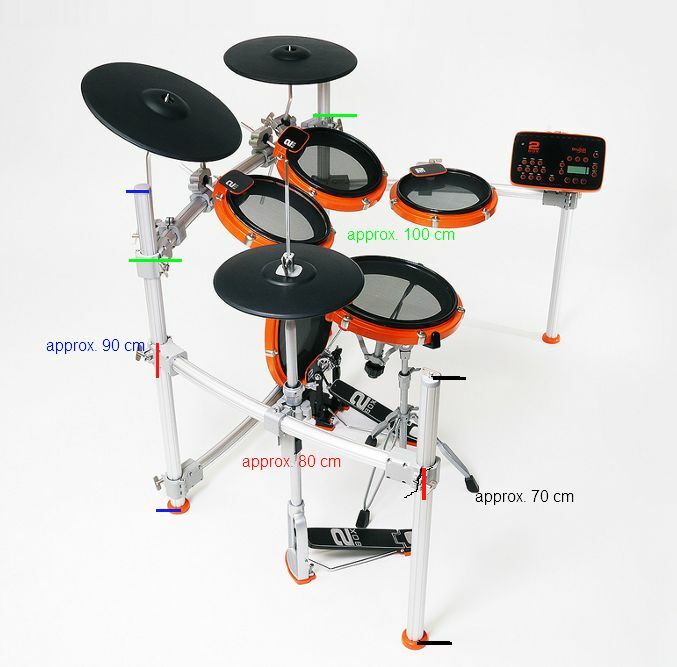 I'm going to buy a 12" and 14" tom, but they will be mounted on snare stands and thus can be moved when required. It's approximately 100 cm wide, 90 cm tall (+ cymbals) and no more than 80 cm deep. @ GenuineHuman Thanks much. It might fit in my bedroom like I planned. 2Box gave me significantly larger dimensions and it had me worried. You need a bit larger area to fit the seat and for cymbals that stick over the edge. In general you need an area of about 140cm (depth) x 160cm (width). Won't work in the area I have then. The solution is going to be a bit expensive....... sounds like it's time to put a sun (drum) room on the back of my house.